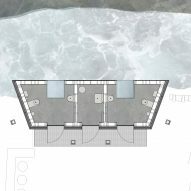 Visitors to Norway's Skjervsfossen waterfall can watch the Storelvi river rush by through a glazed floor panel in the restrooms of this service building, which is clad in local stone to accentuate its connection with the surrounding landscape. Bergen-based architecture studio Fortunen designed the small service building containing two restrooms and a technical room at the site of the waterfall in Norway's Granvin region. 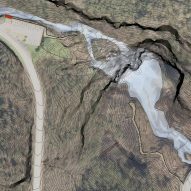 The building is positioned next to a car park on the bank of the river, just downstream from where the waterfall plummets through a narrow channel from the semi-agricultural plateau above. 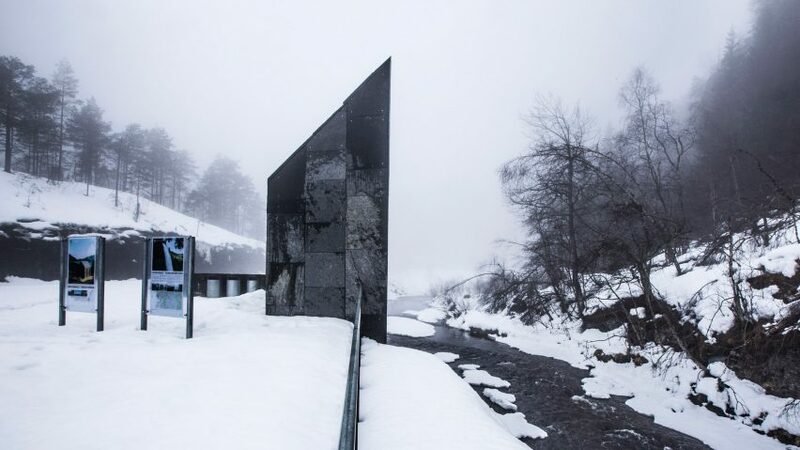 Skjervsfossen is situated on one of Norway's popular Scenic Routes, which have attracted significant architectural commissions including a mining museum on stilts by Peter Zumthor, and Reiulf Ramstad's visitor centre and path network that zigzags across a rugged mountain landscape. The Norwegian Public Roads Administration and National Tourist Routes in Norway tasked Fortunen with creating a subtle intervention that complements its rugged riverside site and makes the most of views towards the adjacent cliffs and valley. "The main concept was to make the wild nature accessible without hurting it," said the studio. "The building appears as a small piece of the mountain, carved out of the rock and relocated to the other side of the riverbank." A mono-pitched form that extends straight up from the river bank gives the building a monolithic, sculptural presence. Its external surfaces are clad entirely in panels of local stone chosen to echo the hues and textures of the terrain. 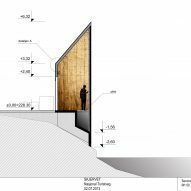 In contrast to the exterior, the restrooms are lined with pine plywood stained a warm shade that picks up some of the tones from the vegetation and trees on the opposite bank of the river. Tall, narrow windows and glass panels set into the concrete floors provide views of the river, forest and mountainside that ascends steeply upwards in front of the building. Oslo-based landscape architecture studio Østengen & Bergo was responsible for planning a series of paths and steps that traverse the landscape and guide visitors towards specific viewpoints. Large pieces of local stone are used to form the trails that branch off from more formal paths around the service building, parking and picnic area. These routes provide access to points of cultural interest identified by Østengen & Bergo. The use of natural stone and the care taken to reinstate areas of turf removed during the construction process ensure that the project's impact on its environment is minimised. "The intention of the architects and landscape architects has been to make gentle interventions that look like they have always been in this terrain, despite their modern form," the team added. "The combination of contemporary form, ancient craft and local materials create a timeless dimension to the project."